Call me late to the party, but I have to admit that in the last few years I've begun to enjoy soccer (football) a bit more and have a cheering interest for the U.S. team come the World Cup every four years now. 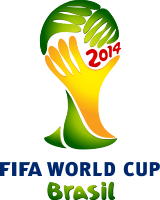 This really began to ratchet up for me four years ago as I watched more FIFA World Cup matches that year than the number I had watched in the previous 9 world cups that I've been alive for. I believe the only other year I watched any matches was in 1994 when the USA hosted the World Cup. Why the sudden interest in a sport I never followed before? I think I can attribute it to a few things. International Football is televised more than ever before now so I hear the names and occasionally see the star players from other countries more than in the past. While I do not understand all the rules of Soccer I had the opportunity to watch soccer live a few times for three or four years while my niece played the sport for her high school team. Watching those games gave me a little bit more knowledge of the rules even though I am by no means an expert on them now. I think the U.S. success four years ago relative to how they have done in the past also factored in a bit. It was nice to see the U.S. get out of their first round group and it built some hope and expectation for the future. I didn't just watch to see the U.S. play though. I watched as many of the matches as I could and it was fun to see the talent of teams like Spain and Brazil and Germany, but also exciting to pull for some of the less notable teams trying to pull a major upset. The FIFA World Cup seems to function as something of a Olympics for one sport. There is an excitement in the pomp and celebratory nature of the event as it is exhibited by the home country and by the fans of all the teams competing. OUCH! The news here says that the U.S. is in the "pool of death" with regards to their group, but looking at group B I can't say this one would be much fun to be in either. My sentimental pick would be Australia, but my head must take priority over the heart on this one. Spain is a perennial powerhouse and the defending champion. The Netherlands are returning as the runner ups in 2010. Chile and Australia are up against it in this group. ranking: Spain-Netherlands-Chile-Australia (sorry Carlyn >.<) I hope Australia pulls the upset though and advances.